So, I am in my robe, steadfastly refusing to get dressed and go to the gym, do the dishes, look at the mini-quiches I made, or take out the trash. And I’m obviously very bored, even though there are friends on Facebook Chat. 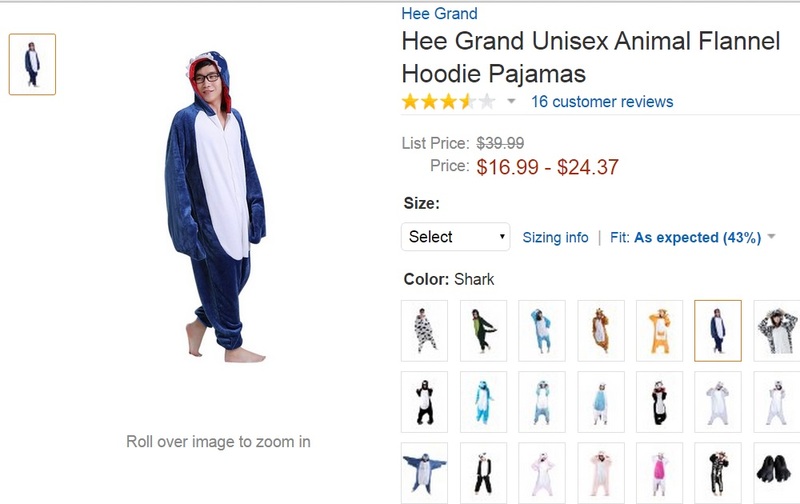 In a not-very-in-depth discussion about shark pajamas, I decided to do some research on Amazon. Scratch that, I use Smile.Amazon.com, where a portion (0.005%?) of your proceeds goes toward the charity of your choice. I’m a dirty hippie who likes clean water, so I chose charity:water. Seriously guys, great job naming yourself. Real original. Great work tho. Anyway, this is how I’ve stumbled upon a great way to procrastinate by writing this post, and upon a terrible, adorable hidden underworld of internet sales. Nothing wrong with this, perfectly adorable. I’ve never pretended to understand Furries. Sorry, Internet. I selected the handsome man in the shark jammies, because he’s handsome and also I was looking for shark pajamas. But if you look, there’s plenty of adorable other animal jammies. I’d list them for you, but I don’t wanna. But trust me, they’re all adorable Asian models. I was trying so hard not to judge, but I failed. Oops, sorry-not-sorry. Now, it’s not that those jammies aren’t cute, cuz they are. They’re fun. But I feel like maybe they’re a little bit, weirdly, sexualized. And that makes me uncomfortable. But not as bad as this thing I found when searching for hamster socks (my sisters really like hamsters, and I like fun socks. It’s not tiny socks for hamster feet, although that would be adorable). I really just don’t know anymore. This entry was posted in Just for Fun and tagged amazon, bored, once on an internet query, pajamas of terror, random, randomly, reaction gifs, shopping. Bookmark the permalink.